Discover Antwerp and its incredible history during a three-hour beer tour. 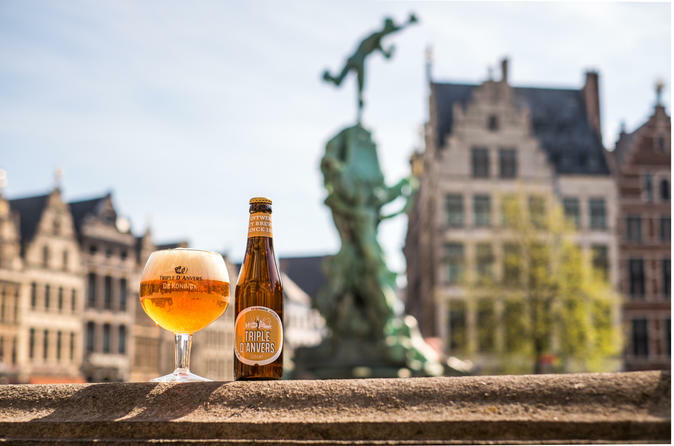 This fascinating beer walk allows you to discover the many historic sites during a city tour and beer tasting with guide in Antwerp. Five beer tasting sessions and an official BeerWalk glass are included in the price. This guided city tour in Antwerp includes one of the oldest beer monuments in the country, not to be missed! You will learn how to better appreciate the different styles of these amazing local beers and discover the best places to enjoy them. The guides' scientific knowledge of beers and brewing, to the historical and architectural influence of the brewing industry on the city, is just scintillating. Antwerp has always been a bustling city, full of excellent bars and beer. The historical tour centres around the brewing tradition with five delicious beers included. Taste very exclusive beers, only available here! BeerWalk was awarded the Certificate of Excellence by Tripadvisor.